Did you know that the tradition of making New Year’s resolutions can be traced back more than 4,000 years to the ancient Babylonians? According to Stephanie Pappas (2013), a senior writer at LiveScience.com, the ancient Babylonians’ resolutions and oaths were more externally than internally focused, and the New Year was celebrated in March rather than January. In a 2012 interview with NPR host Ira Flatow, University of Scranton psychology professor John Norcross PhD, links the tradition of making New Year’s resolutions to the ancient Romans who offered resolutions of good behavior to the two-headed deity Janus who looks both forward (to the future) and backward (at the past). If you’ve decided that this is the year you’re going to take steps to make your microbusiness or solopreneurship (more) socially responsible, congratulations. We need more business owners like you, whether you’re a service-oriented solopreneur or a microentrepreneur with a bricks-and-mortar business. Celebrate your decision to use your business to create positive change in the world. Corporate (and microbusiness) social responsibility (S-R) covers a wide array of concerns and processes, but ultimately it is about recognizing that being a good business or corporate citizen is about much more than just obeying the rules while making a profit. As I explain in my book Small Business, Big Change: A Microentrepreneur’s Guide to Social Responsibility, it’s about doing business in a way that not only creates and offers goods or services that have value, but that also treads gently on the planet, improves the lives of your employees, and generally develops and nurtures two-way relationships with your community, business associates, vendors, suppliers, etc. (2012, p. 9). If this all sounds a bit daunting and your resolve to step up your S-R game is starting to waver because you’re suddenly feeling overwhelmed and don’t know where to start, fear not. If, like many of us in the world, you haven’t always had the best experiences with keeping and succeeding with your New Year’s resolutions in the past, it’s likely that you might be starting to feel a bit squirmy right about now, wondering whether you’ll succeed in your resolution to give your business an S-R make-over. The good news is that the main reasons many of us break or give up on our New Year’s resolutions are that we are either missing some key pieces of information about how to turn our intention/vision into reality (we set unrealistic or vague goals—a.k.a. “pie-in-the-sky” wishful thinking— and we don’t create a specific action plan that accounts for how to deal with setbacks), or we’ve been given bad advice about how to turn our vision into reality: according to a certain segment of popular culture, “all” we have to do is set an intention, clearly visualize the desired outcome, and keep repeating lots of affirmations without actually taking any action. I realize that learning why we didn’t succeed in meeting goals or maintaining New Year’s resolutions doesn’t sound like good news, but it really is good news because it means we can also learn and apply the strategies that will help us be successful in sticking to our New Year’s resolutions and achieving our goals. Kevin Kruse outlines seven strategies for success in his article “7 Secrets of People Who Keep Their New Year’s Resolutions” (2016). These strategies include setting SMART goals (SMART stands for specific, measurable, achievable, relevant, time-bound); measuring progress; developing patience and recognizing that progress is not linear; and scheduling time to work on the goal (if we wait for some time to open up, it will never happen). A similar point to making/scheduling time is that if we wait to feel motivated, nothing happens either. In his NPR interview, Norcross specifically states that motivation comes about through taking small, steady actions toward the goal—even when one does not feel like taking those actions. The assessment process used in my book to help readers identify and define their S-R goal(s) and assess their readiness to take on that goal is very similar to setting a SMART goal. Before selecting and implementing any of the strategies outlined in the book, I ask readers to ask themselves why they want to become more socially responsible. Are they undertaking the process because it genuinely resonates with their values and behaviours, or are they doing it because they think they “should” be sustainable, or because it’s trendy to be sustainable? This step correlates with the goal having relevance. In order to help readers figure out if their goal is achievable, they are also asked to complete a series of questions intended to assess their readiness to implement the strategy (not just in terms of attitude, but also in terms of resources, capacity, social and monetary capital, buy-in from employees) and to figure out what a feasible, realistic goal might be. The goal also has to be specific and time-bound (e.g., How many energy efficient light bulbs are you going to install? Are you going to change every bulb in your work space all at one time, or will you replace three per month over the space of six months? When will this process start? (Today? Next week? Next month?) The goal also has to be measurable not just in terms of output (you installed 36 energy efficient light bulbs), but outcomes. How did installing energy efficient light bulbs make a difference? Did it decrease “x” number of kilowatt hours used? Did that, in turn, have an even larger environmental impact? The assessment process also walks people through a cost-benefit analysis and asks readers to think about how they will deal with various obstacles and setbacks to a project and how they will be dealt with. It’s important to accept that occasionally Murphy has a field day with his law, and if things can go wrong, they will. Having a “Plan B” shows good planning and strengthens resilience in the face of a setback. It also probably saves money and one’s sanity in the short and long term. What small, SMART goals have you set for yourself or your business this year? What are one or two small changes you are interested in making to step up your sustainability quotient, whether in your business or your personal life? Share your goals here and let’s build a community of support for each other. Until next week, here’s wishing everyone a happy, sustainable, prosperous and successful 2017. Pappas, Stephanie, (2013). “Why We Make New Year’s Resolutions,” LiveScience.com. http://www.livescience.com/42255-history-of-new-years-resolutions.html, accessed January 8, 2017. Flatow, Ira (2012). “Making Resolutions That Stick.” (Interview with John Norcross, PhD). “Brain Candy” NPR.org. http://www.npr.org/2012/12/28/168203195/making-resolutions-that-stick accessed January 8, 2017. Chambers, Susan, (2012). 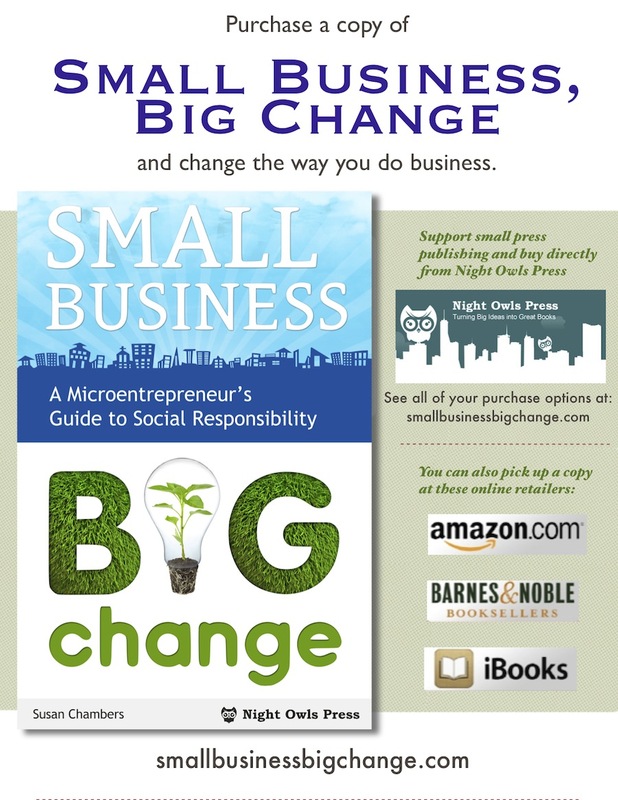 Small Business, Big Change: A Microentrepreneur’s Guide to Social Responsibility, San Francisco, CA: Night Owls Press. Grant Halvorson, Heidi, (2011). “How ‘Positive Thinking’ and Vision Boards Set You Up to Fail: The trouble with the Law of Attraction.” The Science of Success blog, Psychology Today. https://www.psychologytoday.com/blog/the-science-success/201107/how-positive-thinking-and-vision-boards-set-you-fail accessed January 8, 2017. Kruse, Kevin, (2016). “7 Secrets of People Who Keep Their New Year’s Resolutions,” Forbes.com. http://www.forbes.com/sites/kevinkruse/2016/12/26/7-secrets-of-people-who-keep-their-new-years-resolutions/#71308bb77f7f accessed January 8, 2017. For more ideas on how solopreneurs and microentrepreneurs can get started with their New Year`s resolution to contribute to big changes, check out my book Small Business, Big Change: A MicroEntrepreneur’s Guide to Social Responsibility, available as a print-on-demand paperback format from Night Owls Press and Amazon. If you’re looking for socially responsible business ideas and big rewards for a small investment, then this how-to guide filled with practical tips and proven strategies is your dream come true. When put into practice, these tips on environmental, social, and economic sustainability used by real entrepreneurs can help you reach your social responsibility goals easily and feasibly. Using a step-by-step approach to implementing socially responsible business practices, say good-bye to overwhelm and hello to increased sustainability and profitability. Do your part by picking up a copy of this book today. Win a full hour of business consulting with Susan Chambers with a purchase of her book, Small Business, Big Change: A Microentrepreneur’s Guide to Social Responsibility. Susan will chat with you about your small business or green project over Skype or phone. Learning how to start small and still have a big impact. Setting social-responsibility goals for your business. Developing bonds with other businesses and organizations in your community. Reducing your carbon (and other) footprints with strategic green policies. Finding and working with suppliers and vendors who adopt or share your values. To be entered in the drawing, buy a copy of Small Business, Big Change. Forward your order receipt to admin@nightowlspress.com by February 14. Put“Change Your Business, Change the World” in the subject line. Purchases must be made between January 9 and February 14 to qualify. Paperback purchases receive 2 entries, e-book purchases get 1 entry. Drawing will take place on February 15 and winners will be notified by e-mail. Thanks for these great reminders Sue! I’m inspired to name the very achievable goal of reducing the footprint of my mailers. Shifting away from using ones that are mixed paper and bubble wrap, to thin and light plastic sleeves. Need to research suppliers and to ensure that the books arrive unscathed. Hi Kate. Glad to hear the article inspired you to identify and name an achievable goal. Thank you for being an inspiration and for your contributions to this book project while it was being created! Keep us posted (no pun intended) on your goal with the mailer envelopes. Work Happy Now Helps people uncover their passions + strengths so they can be happier and more productive at work.